I’ve had one appointment with Dr. Byler to get my teeth cleaned. His assistant did a first-class job cleaning my teeth. Dr. Byler checked my teeth after and seemed to be very knowledgeable about the condition of my teeth as I had not been to a dentist in four years. 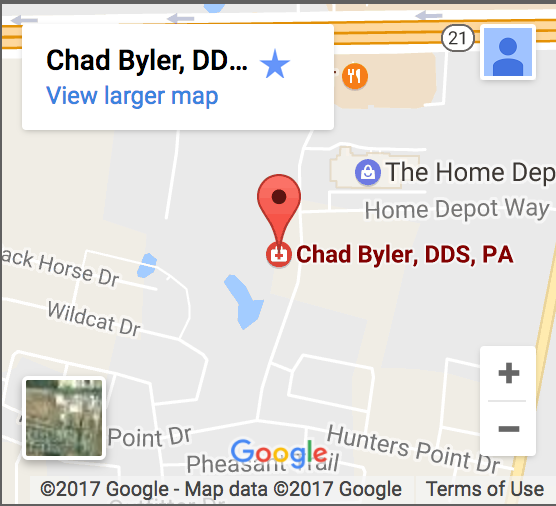 I tried several other dentists in the past year and for one reason or another was not satisfied with them and felt comfortable with Dr. Byler. I have another appointment scheduled in January for further work to be done. All in all I was satisfied with this first appointment. Karen T.
Dr Byler is an excellent dentist. I have been very pleased with his work. Charles S.
I recently had extensive dental work done. I could not be more pleased with the cheerfulness of Dr. Byler’s staff and professional care of his assistants. Dr. Byler’s expert care has given me a smile I can be proud of. Thank you all for making me so comfortable throughout the process.Leslie C.
So happy I switched from my Austin dentist. Friendly staff and always willing try and squeeze you in for cracked/chipped teeth. Repairs are amazing. You would never know my front tooth was repaired. Thank you! Bonnie H.
It’s the best dentist in town. I wouldn’t go anywhere else. Dr. Byler is the best. Bonnie W.
Outstanding dental office. It’s good to go somewhere where everyone truly cares about your well being. Everyone is so patient and understanding. They have earned my trust and business and I look forward to the next visit. Thanks to everyone. Jeff R.
I love Dr. Byler and his incredible staff. I have been a patient of Dr. Byler’s for almost two years now and I actually enjoy my visits. His staff treat you like family and you know you are getting the best treatment possible. Dr. Byler and his staff take their time with you and never rush through your appointment. If you are looking for a good dentist, I highly recommend Dr. Byler. I promise you you will not regret it. Just call his friendly staff and they will help you. Janice M.
I’ve been going to Dr Byler for 4 years now. His office handles pretty much everything in house. Everyone is very attentive and professional. I highly recommend them! Michael G.
Great website! Informative and the links all work. Martin C.
I was in need of a dentist. Had not seen one since my military days in the early 80’s. I went to see Dr Byler and his staff. From the minute you walk in the door and are greeted with a big friendly smile and a warm hello, you feel welcomed and at ease. Dr. Byler is great. He’s friendly and professional and explains procedures in a simple manner that helps you clearly understand your treatment needs. The office staff and dental assistants are wonderful. They are very friendly and professional and work with you to ensure your level of comfort with your dental treatment is maintained. I really enjoyed my visits so far and am looking forward to future visits with Dr. Byler and his staff. As always my visit with Jamie, Dr. Byler and the office staff was AWESOME!!! Wonderful!!! Couldn’t ask for a better experience. The staff is friendly and willing to take the time to work, never rushed. I really appreciate them. Renee S.
Have been a patient of Dr. Byler’s for years. Always a positive experience. I especially like the teeth whitening program, an added incentive to maintain a regular schedule of appointments. I had my teeth cleaned. It was very thorough but also very gentle. I very much appreciate their professionalism and friendliness. Excellent service, excellent people, excellent experience. Can’t extoll Byler and his crew enough. Jamie was great, explained everything in details, and was easy to work with. Staff was very helpful at all times. They are AWESOME! I expected a far worse experience, and actually left comfortable. When you have a tooth issue, this is the only place to come to. Dr. Byler and his staff are always friendly and wonderful and highly skilled at what they do. Plus his lifetime teeth whitening deal for being a regular patient is outstanding! Very pleasant experience. I am happy I chose Dr. Byler’s office and will refer this dentist to my family and friends. Best dental experience I have ever had they took their time and explained everything to me. Great bunch of people. Awesome place! Very comfortable atmosphere, and they helped me tremendously! Cannot say enough.. Initial visit and I was very impressed with both the staff and Dr. Byler. Dr. Byler was very thorough in his explanation of issues with your teeth. A very comfortable environment. Great bedside manner. I am very pleased to have found him and his office staff. I have been a patient here a few years now. I am always treated very nicely. Dr. Byler is very professional. Myself and my son have always experienced professionalism in the care of our teeth. My family is very satisfied with the service we are provided. The one thing I like and rely on are my reminders for appointments. Reminders help more than you know 🙂 The entire staff deserve a round of applause for their dedication and keeping clients in line. Jamie the hygienist always WOW’s me with her service, dedication and keeping my teeth healthy and telling me how it is, no games. My family says thank you to your entire staff. My first visit was very good. The staff were very helpful, and Dr. Byler was very informative and seemed knowledgeable. All the staff was very friendly and professional. Jamie did an excellent job on my cleaning and was very thorough on explaining my dental needs. Dr. Byler was great when explaining what treatments he recommended. Overall a great experience and would highly recommend to others. Very pleasant and informative. Everyone was very friendly. I have not been to a dentist in a very long time. The staff worked very hard to put mind to ease.